There must be some things in life that you can always count on, mustn’t it? So there’s the fact that when the toast falls it will land with the jam-side down. If you are bringing the umbrella, it won't rain. If you don’t, it does. And immediately after you have washed your car it will also rain. It’s red lights all the way to your office if you are running late. However, from now on, there’s actually something good you can count on - all the parameters you have saved for your project view will be the same if you open the project the next time. Remember how it used to be kind of tedious when you opened a project in a separate view and its’ parameters were always default? Its’ timeline was always set to from start until the very end of the project. There was no special grouping to the resources. Tasks weren’t colored they way you prefer them to be. Now, all that is history. We are introducing an additional save button. It might not sound like much but it really is. If you have very certain planning habits, it’s going to save you heaps of time. For example, if you are the kind of project manager that likes planning resources only a day or a week ahead, you’re going to love it. You can have all the projects that you are planning resources for open in separate views and set the time shown in the planner to a day or a week, and voilà. Just get plannin’! A one-day project view saved with no resource grouping and coloring by task status. 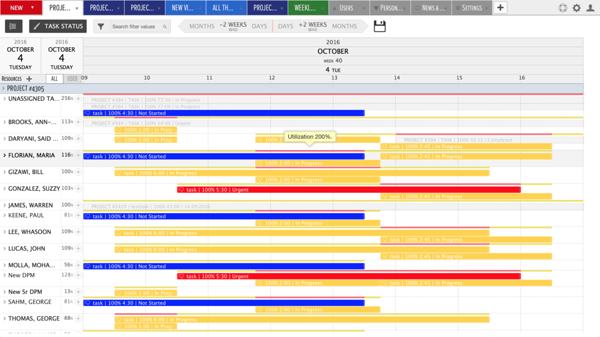 A two-month project view saved with resources grouped by resource group and coloring by project color. The new resource planning feature works great for you if you have very different projects on your hands, too. Or even if you have different roles in different projects. If you just need to have an overview of some of the projects you are handling, and need to go into the details with others, you can set different parameters for each project. And here’s another good things: the parameters you have chosen are user-based. Meaning that every user can save the parameters how they like them. 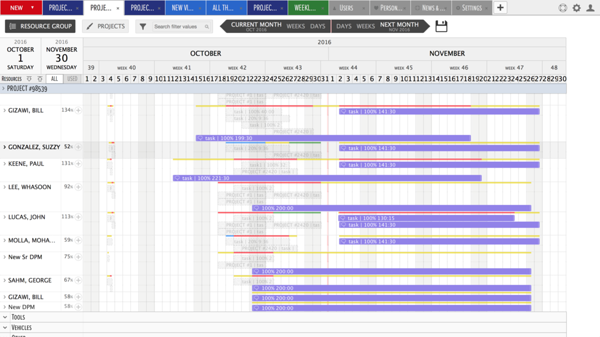 So yes, Ganttic is the resource planning software you can count on to make your life easier. In a way, we are like the jam on your kitchen floor. But, you know, in a good way. If such thing is possible. It probably isn’t. But you know what I mean.